Welcome back to Talk Digital to Me! Today, we’re welcoming Convince & Convert’s Community Manager, Christin Kardos. As Community Manager, Christin is a wizard at engaging Convince & Convert’s audience via social media. She’s an expert at getting our podcasts and blog content in front of our fans, as well as curating the best content from elsewhere on the web. Today, she’ll share how she does it all, plus the skills every great community manager needs. You’ll hear her advice for first-time livestreamers, what too many brands get wrong about social, and what’s in store for the future of community management. Watch the video for more expert advice from Christin! Kate: Hey, everyone. Welcome to “Talk Digital to Me: Conversations on Marketing and Customer Service” with the pros at Convince & Convert. I am Kate Volman, and I have the pleasure during each episode of interviewing one of the team members over at Convince & Convert. Today, I am joined by Christin Kardos. 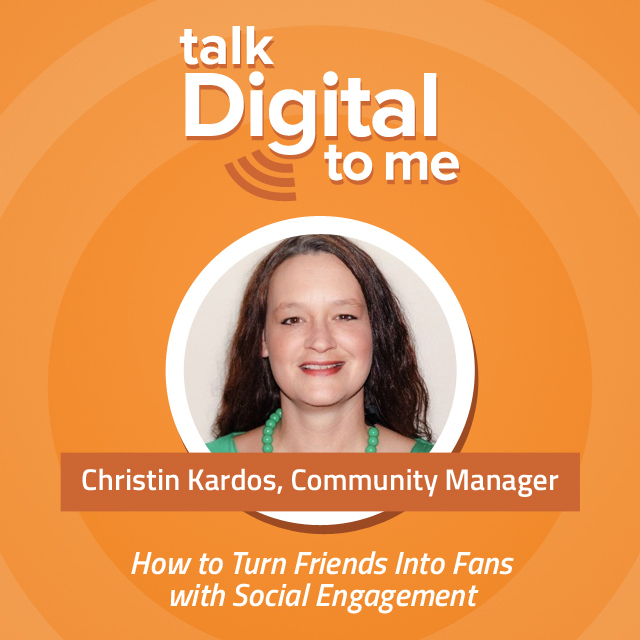 She is the Community Manager, and I’m so excited because today’s topic is how to turn friends into fans with social engagement. So Christin, how excited are you about this topic? Christin: Well, welcome to the world of live video, because what I was doing, I had myself muted. I have the Facebook page open where we’re streaming, so I was hearing you talk still, and I didn’t want to unmute myself, because then everyone would’ve heard you talking again and it would’ve sounded weird. This is reality, you guys. Hi, everybody. I’m Christin. I’m Community Manager at Convince & Convert. I am so excited about this conversation today. I’ve been looking forward to it all week. Kate: Yes, yes, me too. So before we dive in with some really great strategies and content, why don’t you share with everybody what you do as the Community Manager for Convince & Convert? Christin: So essentially, the Convince & Convert team is made up of . . . I don’t remember how many of us there are now, 10 or 12, including Jay Baer, who is the President. Then we have a team of consultants who do consulting work for big brands on social media and content strategy. And then we have some folks that work on business development and operations, and then we have our content sorceress, Jess Ostroff, who’s the Managing Editor for Convince & Convert Media with the blog and the podcast. Then you have me over here on the side, doing what I do, which is community management and social media management for our team for Convince & Convert. So basically, for the most part, our community is a social media based community. We are on the different social networks, engaging with the people that like to read the blog and listen to the podcast. We also do have a Facebook group, and that is Jay’s Facebook group that he started around the concept of the “Hug Your Haters” customer service side of things. So that Facebook group is there as well. But basically what I do is I help to promote our content, curate and share other good content that falls in line with our values and what we talk about on a daily and weekly basis, promote Jay’s speaking events and his books and other people on the team when they’re involved in things like webinars and speaking engagements and that kind of thing. I promote those things via social media, but then also my job is to be interacting with the folks that are listening to and watching us and talking to our community, and actually having conversations with people. So that’s what I spend my time doing. Kate: Awesome, and I feel like that’s . . . I mean, it’s definitely fun. You get to do the fun stuff where you get to interact with all the people who . . . I mean, you and your team create so much content. So obviously there’s a lot of stuff out there for people to be talking about, to be commenting on and sharing. Some companies, it seems like they’re not necessarily . . . they’re putting out content, and they’re not engaging with those people. This is the opportunity that we have to engage with our clients and customers and people that are checking out our businesses. So before we go into some of the strategies and talk about some of the stuff that you do in order to make this happen, why don’t you share some common mistakes that some of these people listening might be making when it comes to really just using social media as a way to increase or improve their customer service experience and really engage with their clients? Christin: I think the biggest mistake is probably apathy or sort of “spray and pray,” where maybe they’re broadcasting things that are related to their business objectives but not actually having two-way conversations with people. Or missing things that people are saying to them and about them. Opportunities to actually, whether it be the customer service side where let’s say somebody is complaining and they’re not directly mentioning you, those opportunities to actually get involved in the conversation and try to get a customer service win. But also just the day-to-day, someone’s being kind enough to say nice things about what you’re doing or to ask you questions. You have to be there to respond to those. And I think sometimes what happens is, especially with smaller or newer businesses, or even solo-preneurs maybe who are starting out with their social presence, they don’t realize how much effort is going to be required to do a good job on the engagement side of things. You think about the outgoing and not so much the interaction, the two-way part of it. So I think if there was one thing that I think is the biggest mistake, I think it’s that. And maybe like I said, maybe born of underestimating the requirement in terms of time, budget, what have you. To me that’s the most important aspect of it. It doesn’t do any good to just throw things out there if you’re not going to establish any meaningful dialogue around them. Kate: So let’s talk about, you mentioned people that might be complaining or saying some not so nice things about a business. What do you recommend companies do when that happens? Christin: Well, now you’re speaking Jay Baer’s language, because he says customer service is a spectator sport. The point is that no matter what they said, whether their complaint is like legit, like, “You messed up my food order,” or they’re just really mad about something that happened, regardless of the substance of the complaint, if somebody’s taking the time to actually vocalize their problem with you or your business, then you absolutely have to respond to that. Number one, because they deserve it because they’ve spent money or what have you, and number two, because people are watching you. It says a lot about who you are and how your business operates if you do not address them or you address them in a non-productive kind of way. So you definitely have to, you want to respond, try to have a solution, work toward a solution. Definitely be courteous. No canned responses, ever. Put a human in charge. Jay talks about all this. I feel like I’m sort of parroting him. But smart businesses empower the people on the other end of that, be it social media staff, customer service, whatever department they work in. They’re empowered to actually respond to those people in a pro-active way, and that’s important. Kate: So do you think that a company should have an actual, like you, like a community manager position? Or just make it a little bit more clear to someone that’s creating content? Like how does that work as far as like a team situation? How should someone structure that so that it’s all . . . people are obviously sharing the content and engaging with the audience? Christin: I think in a sense it’s not one size fits all, because it depends on the particulars of the business. But I do think it’s smart to have people covering all those bases, and then have those people or teams, however big your organization is, plugged in with each other. You don’t want to have silos there. It’s really good if everybody understands each other’s mission, each other’s areas of ownership, and can then proceed and do what they’re supposed to do armed with that knowledge, and to know who to contact if there is something that maybe goes outside the scope. I mean, for example I get contacted all the time for things that are related to, say, the blog. Somebody who wants to be a guest blogger, or they have a question about something. I know that now I’m definitely going to respond, because I’m the front line on responding to them. But I also know that there’s someone else on the team whose wheelhouse that is. So we’re going to work out the best way to get back to that person. You know what I mean? But do I think that businesses, if they’re going to have a social media presence and going to be on the Internet discussing their business, absolutely I think they need someone doing some version of what I do. The structure can be different, but there needs to be someone doing it. But now there’s live streaming, and you have different chats and different Facebook groups and ways that people can really engage. So let’s talk a little bit about live streaming, because obviously it’s a real big topic now with Facebook Live and a lot of these people that want to take advantage. So what are some ideas, or what do you see some companies doing right , or what are you doing that you see works really well as far as engagement and getting people excited about your brand? Christin: I think the biggest thing is people don’t love logos, they love people. So regardless of the size of the brand, any time that you can get the people behind the brand or even associated with the brand, whether they’re advocates, customers, what have you on camera with their face, with their voice, and people can see what it is that they have to say . . . it can be something emotional, it can be an event, it can be promoting a cause or even a business initiative. But if you’re talking about things other than just dropping a link to an article, you can have a two-way discussion via live streaming. Even if it’s a Periscope or Facebook Live, people can comment. You can then follow up with them. Some of the most interesting ways I’ve seen it used is definitely at live events. It’s a great way to share content with people. The content itself is valuable because if I can’t go to your event in, say, Phoenix, then it’s great if I can see what’s going on there and what you’re doing behind the scenes is another good thing. I’ve seen it used well to demonstrate how a product is made, that kind of thing. And video is the new black, so making something into a video is a great way to not only to grab attention, because attention is in short supply these days. It grabs attention, but it can get a lot more across in a shorter period of time. There’s just a plethora of ways it can be used. But the key thing is, like my friend Brian Fanzo says, looking at somebody’s digital eyeballs, hearing them speak, and what it is that they’re talking about can vary. But I personally really enjoy it. Jay does it. He’ll do a live stream on Facebook every so often when he’s excited and pumped up about something. I love that. He’ll say, for example, this week, the most recent episode of “Social Pros,” which if you’re watching the replay of this you need to go listen to the episode, we had the founder and CEO of charity: water on the podcast, and Jay was super pumped up about that because the podcast donated a well to a village in Ethiopia. They teamed up with charity: water, and so he was excited about it and he went on Facebook, and he did a video. That’s really great. You can do pre-recorded videos too, but when you do things live, it’s super exciting. Kate: Yeah, that’s so cool. And I love it when people do the live Q&A. They just jump on and they just start answering questions. For some people who might not have a big audience, I know that they get a little nervous, like, “No one’s going to watch.” That might be the case, but at the same time you can go on there and still ask questions that you have been asked through email, or . . . just to kind of get used to it. I think a lot of people don’t love being in front of the camera, but getting a little bit more used to it. Christin: You know, my personal experience with that, I took part in a challenge back in April, vlog every day in April. Now I want to be very clear about this. I’m not a vlogger. But I had my reasons, and so I did it to support a group effort. So I did it. And I did a series of daily, what I consider to be horrible Facebook live streams on my personal profile. Christin: So using myself as an example, if someone like me who isn’t a blogger, isn’t a vlogger, isn’t polished, not necessarily super-good on the production end of things, if I can get that kind of reaction just from people that I know, it’s kind of remarkable. It’s very powerful. Kate: And you did that through Facebook Live? Christin: I did. And Facebook Live is very sticky. It’s very . . . people are notified when you start a broadcast. It’s a very easy way to get attention, which was much to my dismay at the time. But it works that way. Kate: For someone that’s watching or listening that are like, “Okay, I’m going to do it, I want to try one,” is there anything that you think was something that you learned while setting it up or getting it started? Or anything that you think would be helpful for people before they do their first one? Christin: Yeah, I think maybe just in general, try not to be scared. But also have an idea, have some kind of premise of what you’re going to talk about. Go on, say what you’re there to talk about, talk about it, summarize it, and leave. If you want to look at comments, if comments are coming in and you want to look at those, that’s great. If not, you can follow up with them after. But just don’t let it own you. You just go on and you own it. It’s not going to be perfect, and that’s okay, because that’s the beautiful thing about live. It’s not perfect, but it’s genuine, and people appreciate that. Kate: Awesome, yeah. I’m a huge fan of videos, so I think that more and more businesses should really use it so that people can get more comfortable with the people that they’re talking to. Or especially, I remember when I got to interview Jay, I already felt like I knew him just because I listened to his podcast and I read his books, and I really felt like . . . and through his videos, you really feel like you get to know someone. That alone, just as far as customer service and experience, I think is huge. Just because people feel more connected with you. They’re probably not going to write that negative thing on your page. They’d probably do it in a much different way because they feel that connection. Christin: Yeah, I just think it’s a faster way to connect, and it’s a way to quickly strengthen and deepen connections. I agree with you. Kate: So let’s talk about some other things. What are some other fun things that people can do, just to increase engagement? Again, I feel like a lot of businesses, they are so focused on, “I have to create the content, I have to post the content, and then I’m going to be done with the content.” So what are some things that people can implement in their … to start to improve that engagement? Christin: Well, I think you can start simple. I’ve always been a fan of the social media is like a cocktail party analogy. If you go to a cocktail party, somebody might say, “What are you up to?” and you say, “Well, I’ve been doing this.” That’s your blog post, right? But then, you don’t just walk around going, “Look at my blog post.” You don’t walk around a party saying, “Look at my new shoes. Look at my new shoes right now.” That’s not how you behave at a cocktail party. You have conversations, right? So you ask other people about what they’re doing. That can mean, and from a social media standpoint, that can mean asking your community questions. Whether they be questions about how their week is going or what they’re working on, or how do they feel about something you wanted to do, maybe. That’s a piece of it, but you can also go to other communities and be a good citizen there, and just communicate and have conversations without selling anything. You’re not selling anything. You’re taking an interest. My friend Rachel Miller likes to, I think it’s a famous quote. I don’t remember who said it, but, “Be interested to be interesting.” That’s kind of the underlying concept behind basically everything that you should do to increase your engagement. Take an interest in the people who are already supporting you. Show them some love along the way. It can be simple thank yous. It can be sending personalized notes. It can be hopping on a hangout or a call like this, with an advocate or somebody that has done a lot for your organization. Those are individual things that you can do, but just in general, listening more and asking more questions … just broadcasting. Kate: I love that idea of collaboration. I think more and more people are doing that. I mean, Convince & Convert is awesome at that. You have so many different podcasts from people with different companies and different initiatives. That’s huge, so I like that tip, to just get with advocates and strategic alliances. In that same, kind of going in that same direction as far as Facebook, like Facebook groups, I feel like everyone has a group now. Is it worth setting up a group? Should businesses set up a group, or should they be more focused on maybe joining other groups and providing value there? Christin: I’m not the authority on this, but I do think my question, my litmus test for that would be is it for them or is it for you. Because if what you’re doing is supposed to further your own agenda almost exclusively, then you should be looking at having a Facebook page. If it’s a marketing initiative that you’re really trying to . . . not to say that you can’t get a benefit out of a Facebook group if you are a business, but that really should be more about the people in the group and the value that it’s going to bring to them versus your business objectives. So Facebook groups are incredibly powerful, because like live video, they’re very prominent in notifications. I think lately everybody feels like Facebook is getting really noisy. There’s more and more content, we’re all accumulating friends as time goes on, it’s just getting more and more, so we may be missing or even ignoring things that are in our feed. When we get those notifications, for example if we’re in a group that we like and those notifications come through, bam. We’re going to go in there and we’re going to go check it out. The group thing is very powerful, but I think it’s more useful for connecting people to each other. So for example, we don’t have a Facebook group for Convince & Convert, because we don’t think there would be any value for the community there. What would the value be? But Jay started a “Hug Your Haters” customer service Facebook group right around the time his book was coming out. I think he initially invited in people who bought advanced copies of the book. But that group, the objective of that group and what it’s proven to do, I think, is let those people connect with each other and share stories and ask questions of each other, around that central topic and interest. I think in that case it’s really good. And he’s not selling anything in there. It’s just a community of people that it’s almost self-sustaining, because they’re giving value to each other. That’s the premise behind a Facebook group. So if you’re just trying to sell red widgets, don’t start a Facebook group and invite people in. Kate: Good advice. So do you have some examples of some brands or businesses that you think are just awesome when it comes to engagement on social media? Christin: I do. I have a lot, and this is the only question that I fretted over in advance. Like what am I going to say? Because I say the same ones a lot, but you know what, I’m just going to say them anyway. One of my dearest, most beloved is Applebee’s because they absolutely crush the social listening game. They’re also a lot of fun. I mean they’re a ton of fun with their content and some of their initiatives. They’ve done some activations where they’ve had people go out and do live streaming. I mean, not necessarily professionals. I even participated in one of their efforts. It was called “Chase the Change.” Anyway, but their social accounts are a lot of fun. They are light-hearted, but very attentive. You can mention them indirectly and they will respond to you within moments. It’s kind of interesting to see that happen, because you know they get a lot of traffic. Today I was actually poking around, looking at Jet Blue, Jet Blue Airlines. They are actually really amazing because they do have high, high volume of interactions, but they’re on top of it. They keep it fun. I saw a tweet earlier today, somebody tweeted them a question about flying with newborn twins. And the reply was the answer to the question but they hashtagged it “#doublethefun.” So just taking care of business, but keeping it fun and being interesting. Which is kind of a tall order, but there are some brands like those two that I just mentioned that are doing a great job at it. SAP, I want to shout them out, because they have done some interesting not necessarily inside the box things with their social. They have sponsored some live streaming. I don’t want to go into a lot of detail about this, because I’ve worked on some of it. So don’t want to sound biased, but I am. They’ve done some interesting things using live streaming from events and elsewhere to connect with an audience. I think they’ve reached a lot of new people by doing that. So combining the live streaming with the other platforms in social, and tying it into a big initiative and making it about community. They’ve done a really good job. Kate: Cool. Those are great examples. And I love that you said “fun,” because you have to have fun with this. It’s social media, it’s engaging with people, and I think a lot more brands are getting more comfortable with that than they used to be. I feel like a lot of businesses didn’t really feel like they could share the fun side of their business, or post pictures of them in their office, or behind the scenes type stuff. I think more are getting comfortable with doing that kind of stuff. Kate: And like Jay says in his book, in “Hug Your Haters,” I loved when he talked all about the statistics behind how we expect more now from social media and how we interact with people. Maybe we can talk a little bit about that, and how important that is to keep up with making sure that if someone is asking a question through your Facebook page, I know sometimes it’s taken days for someone to get back to me. Just because oh, I forgot that you can message someone from the page. Or … set it up and then leave it. Christin: Yeah, a lot of businesses are missing opportunities. Sorry, got an echo now. Yeah, a lot of businesses are missing opportunities to respond to people. And they just, that’s a big fail. Not only to respond but to make sure that when they do respond, they’re trying to win that customer over and be useful in a longer term sense. One of the stats in Jay’s book is about how businesses spend an atrociously larger amount of money on marketing than they do on customer service. So we’re going to all this trouble to get new people, but we’re wasting opportunities to keep the people that already liked us in the first place. Not only that, but those kinds of opportunities where somebody is maybe displeased, or even confused or whatever the case may be, anything that’s even slightly negative, those people, if you resolve those situations well, they can really turn out to be die hard fans. It can really make a relationship where one barely existed or didn’t exist at all. Yeah, and that comes back down to listening. Listening and paying attention. And it’s no small feat, especially if you’re a large brand. I can tell you, because I do engagement for Convince & Convert but I also, I do not do . . . I want to be very clear about this. I do not do Jay’s social engagement. If you get any kind of comment from him, if he likes something or tweets you or whatever, that is Jay doing that. But I do listen. I do do some listening for him because the volume would just blow your mind. So that goes back to people need to understand how much is going to be required from a resource standpoint, but it’s worth it to allocate those resources and make sure you’re hitting every single one of those. Kate: Absolutely. That’s awesome, and good to know. If you’re getting tweeted by Jay, it’s actually Jay. Kate: All right, so we have a couple more minutes left before I ask you your bonus round questions. Do you have any last minute advice for businesses? Like for a small business, if you were going to step in now and do some kind of integrating like a more strategic way to engage with their customers, what would be some kind of a strategy that you would implement? Christin: I just think start small and master one thing at a time. So if you just launched your business, don’t go out and get accounts on every single social media network that exists on the planet, because there are tons. Know where your customers are, and that depends on your business, but know where they are and try to do it well in maybe one or two places, and build from that. So one thing at a time. Foundation, and then start building. Just make sure that each piece of that, that you do well as you go along and don’t try to do more than what you can do. Better to do it well than do it everywhere, is my thought on that. Kate: And one more thing, because I feel like this could be really valuable in the sense that I know a lot of companies are really focused now on getting the ROI on social media and what that looks like. It’s becoming easier obviously, with tracking ads and figuring out how many people you’re actually getting to click and then buy. But for something like social engagement like this, because it’s huge, it’s important, like you said, that stat about doing more marketing than really loving your customers now. So how can, or what should a small business do to make that such a priority that they’re tracking it? So that they realize that this engagement piece is big and needs to be tended to. It needs to be part of that overall content strategy. Christin: I think it goes way beyond just this piece or department at an organization. It goes to the culture of the organization and the thinking of the leadership, and I think it’s top down. I think there’s no real way for somebody to come in and put that on a spreadsheet or a white board and make it click immediately. I think there are people who just understand that it’s, as they say, it’s cheaper to keep them. You need to have a strategy in place for taking care of the people that already love you. I mean, a social media person can come in and give some data. But I haven’t found that that’s always the most persuasive thing. The most persuasive thing is them having that culture and mindset to begin with. Christin: And so I’m lucky, because Jay does. That’s why he brought me onto the team. Fortunately in my case that’s a battle that I don’t have to fight. There’s one other thing that I would say though too, in terms of advice. The digital and social media and landscape is always changing. It’s literally changing every single day. There are new tools, there are new platforms, there are new hacks to do more with the existing platforms. There are people coming out with different ideas on how to use the ones that are already there. So the only thing that I wanted to add was that you have to constantly pay attention, keep learning, and always be willing to measure and adjust as needed and try new things. Kate: Awesome. Love it. Yes, try new things. Some things will work, some won’t, but you have to try. Okay. So bonus round questions. The first one is, what is your marketing superpower? Christin: I think mine is empathy. And maybe that’s a bad way to put it, but I find almost every person that I encounter in any situation to be relatable in some way. Even if we would appear to have nothing in common. Even if maybe the encounter is initially a negative one, I’m usually able to find that common bond because every person has at least one thing in common with another person. So if I had to say I had a superpower, I think it’s just being able to relate to people. Kate: Which is why you’re such a great community manager. Okay, number two. What digital marketing trend are you most excited about? Christin: I bet you know my answer. Live streaming. I’m excited about . . . I mean obviously, first of all, live streaming’s actually been around for a long time. It just wasn’t widely adopted or easily accessible to the masses. What I’m excited for is to see people get more creative with what and how they’re livestreaming. I’m excited for the potential for Facebook to maybe take Facebook Live and make it into a conferencing in people opportunity, as we’ve talked about offline, so that we could do something like this right on Facebook Live. So yeah, I’m excited to see the tech and tool improvements around live streaming, and I know they’re going to come, because it’s the new way of things. Video. Kate: Yes, absolutely. And okay, if you could only have one mobile app on your phone, what would it be? Christin: Okay. Well, if I can only have one mobile app, then I’m going to assume that I don’t have to work. So my answer is IMDB, Internet Movie Database. I use that app incessantly. I’m kind of a trivia junkie, particularly trivia around entertainment, so actors and actresses and songs and musicians, that kind of thing. So I’ll be watching a show, or I’ll just hear something, and I open that app . . . I bet I open that app like five times a day. Because I want to go, “Wait, I recognize that person,” or, “Wait, isn’t that person married to so-and-so?” So that would be honestly, if I could only have one, that’s the one. Christin: Well, I couldn’t pick between any of the social or connectivity apps. Kate: Yeah, but . . .
Christin: So I had to just go . . . But I really do use IMDB literally probably 50 times a week, so. Kate: That’s awesome. And you know, I have to say I can’t even . . . I keep thinking about your challenge. I think it’s so cool that you did a 30-day live streaming challenge. I feel like people listening, you should just make yourself do that. Because that is one way that I know would be so . . . I mean, it’s huge for people. You know you have to do it, you’re committed to doing it. What a great way to kind of get this stuff going when it comes to live streaming. So I hope some people end up doing that. Well Christin, thank you so much. This was super-helpful, and there was lots of great strategies and tips for people to engage with their customers more, build better relationships through their social media sites, and so thank you so much for sharing all of your insight. I appreciate it. Christin: Thank you so much, Kate. Thank you. Kate: Thanks everyone. We’ll see you soon.